Mobile analytics firm AdMob has just released its March 2010 Mobile Metrics Report and I can’t help but cringe over the fact that while the Android OS is enjoying significant traffic it is still falls inferior over the iPhone OS. According to AdMob’s report, while the Android OS is steadily gaining traffic while it tries to reach the iPhone’s status, the fact still remains that there are more mobile phone helping the Android OS achieve this feat. In fact, 11 Android devices account for 96% of the Android platform’s overall mobile traffic. Total Android phones currently available in the market is around 35 handsets from several phone manufacturers. In contrast the iPhone is running on devices developed by one manufacturer. Looking at the specific Android platforms and their share of market will give us the Android 1.5 with 38% of market share, Android 2.0/2.1 gets 35% of the share and Android.6 getting 26% of the market share. 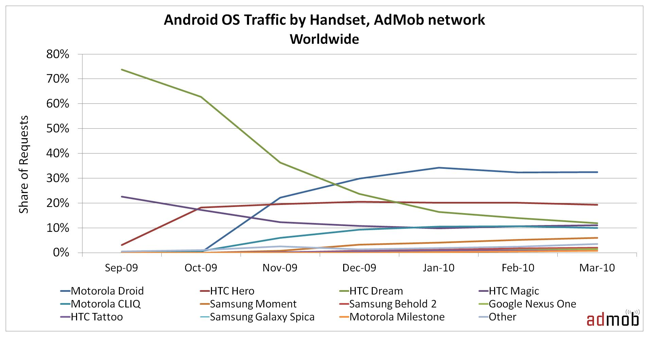 In terms of manufacturers, both Motorola and HTC tops the list with 44% and 43% of March 2010 mobile traffic. Motorola Droid was the leading Android handset in March 2010 generating 32 percent of Android traffic, while the Google Nexus One drove only two percent of Android traffic. At least 54 percent of Android traffic came from devices with a QWERTY keyboard. Three devices – the iPhone 3GS (39 percent), second generation iPod touch (25 percent) and iPhone 3G (20 percent) – generated 84 percent of total iPhone OS traffic. iPhone 3GS traffic share has increased from 30 percent in September 2009 to 39 percent in March 2010. The 1st Generation iPhone only generated 2 percent of iPhone OS requests in March 2010. Total worldwide traffic in AdMob’s network increased 18 percent month-over-month.